I don't know about you but I love a good pamper and that's exactly what today's post is all about, it's all about a product that has changed the way I look after my skin for the better AKA the best shaving gel I have ever tried. I've been trying this product for a few weeks now and I can officially say its a treat and within a very short space of time, I have become so bloody obsessed, it's crazy. 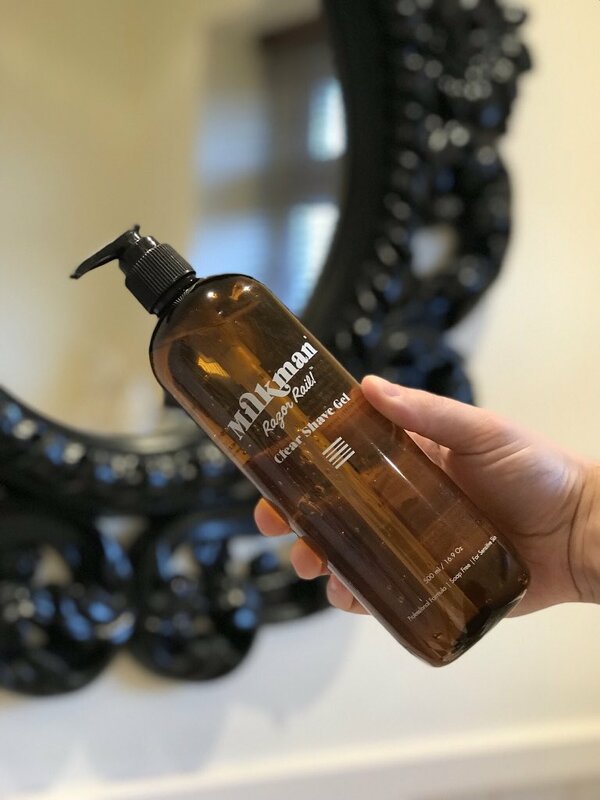 It's a pleasure to say this post is kindly in collaboration with Milkman Grooming and there is a chance for you to win your very own bottle at the bottom of this post - if it's for yourself, your dad or your boyfriend you should join the giveaway! New year, new products - let's all try something new because I have and I'm in love. At the start of this year, I told myself that I want to look for brands I never usually look for and buy products I never normally buy and I'm so glad that I've started to do it because I've found a good un'! The Clear Shaving Gel from Milkman Grooming is the ultimate shaving lubricant for people (I've heard loads of women rave about this too!) with sensitive skin. It's soap free and clear, so you can see exactly what you're shaving! I have noticed such a positive impact on my skin since using this gel and I've only needed to use 2 pumps per shave (yes it has a pump too!) so it will last you for ages. I think with things like moisturisers and shaving gels, it's so important to try different ones to find the best one for you as different skin reacts differently to different ingredients and I think a lot of people just go with whatever is available and what 'does the job' but looking after your skin is so important because we only get one, I don't know about you but I want to be using things on my skin which do the most for my skin and this is exactly what I have found with this product. If you're looking for a new and exciting product that is going to step up your skincare routine, this is the product for you. I would 100% recommend this product to anyone as it makes my skin feel super comfortable - it has aloe vera in which helps to remove dead skin cells. There's a form below where you can get a chance to win your very own 500ml bottle (I am not personally running this giveaway and all winners will be contacted directly by Milkman Grooming). Disclaimer: This post is kindly in collaboration with Milkman Grooming. Links within this post are affiliate links, which means I receive a percentage of the revenue made from purchasing products through the links placed on my blog. This does not affect you as the consumer OR the price of the product.